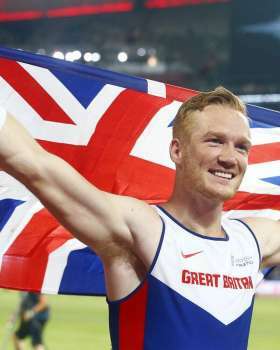 Olympic, World, European and Commonwealth champion, Greg Rutherford is Great Britain’s most decorated long jumper and one of the country’s most successful Olympic athletes. After a successful junior career, Greg won gold at the London 2012 Olympics. This began a winning streak of gold medals; at the 2014 European Championships, 2014 Commonwealth Games and the 2015 World Championships. In 2015, Greg topped the long jump ranking in the IAAF Diamond League, the athletics equivalent of the Champions League. At the end of his 2015 season, he held every available elite outdoor title. He is also currently the British record holder, both indoors and outdoors, with PBs of 8.26m (indoors) and 8.51m (outdoors). These successes place Greg among the ranks of the British supreme athletics performers - simultaneously holding 4 major outdoors titles - he sits alongside legends such as, Linford Christie, Sally Gunnell, Johnathan Edwards & Daley Thompson.